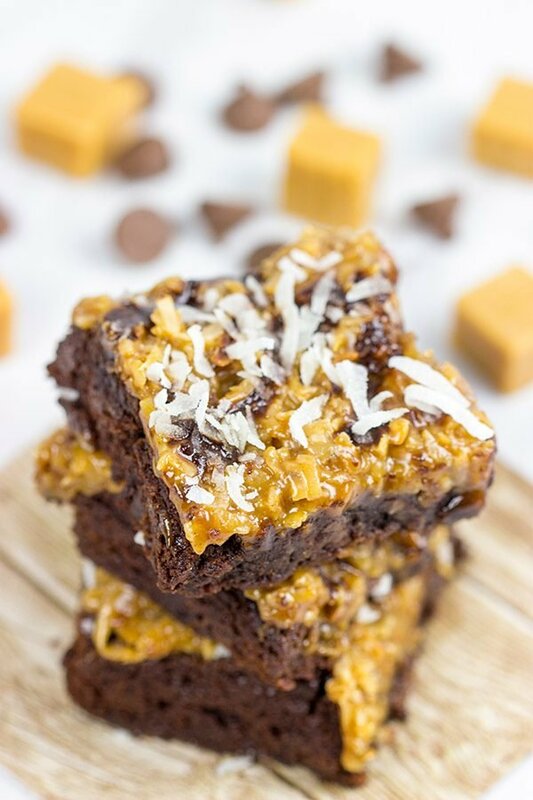 Inspired by the classic Girl Scout Cookie flavor, these Samoa Brownies are one of our favorite sweet treats! We’ve hit that time of the year when I start using the side door at our local grocery store. Or if not the side door, then I duck in behind a crowd of folks and quickly walk straight ahead without making eye contact. Yup, it’s Girl Scout Cookie season. Hi, my name is David, and I have a problem with Girl Scout Cookies. I seriously can’t pass by the table without stopping to get a box or six. I mean, it’s for the kids, right? I’m helping them out here! When Laura and I were first dating, I’m ashamed to admit that she found my stash of Thin Mint cookies in my pantry. I think I had 6 boxes squirreled away in there. And it was October. Oops. So now I pick up a couple boxes (It’s for the kids! ), and then I carefully and strategically avoid the Girl Scout Cookie table for the rest of the season. The Girl Scouts even have an app that lets you find cookies near you…that’s just about as bad as the Krispy Kreme app that tells you when the donuts are hot! While I do still love Thin Mints (especially frozen), Laura has made me see the light when it comes to Samoas. 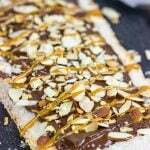 The combination of caramel, chocolate and coconut is just so darned irresistible. (For the record, we now buy 1 box of Thin Mints and 1 box of Samoas.) While I might be adept at avoiding those friendly Girl Scouts and their cookies (It’s for the kids! ), I still give in and make delicious Girl Scout Cookie-inspired treats here at home. Take these Samoa Brownies, for example. 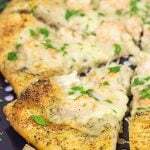 I made these for friends a couple of weeks ago, and they were so tasty that I had to make them again. I had to! I used my go-to brownie recipe and topped it with a combination of caramel and coconut. So good. I swear I could eat the topping off of these Samoa Brownies with a spoon! But I do have my limits…even if said limits are were set at 10 boxes of Girl Scout Cookies. 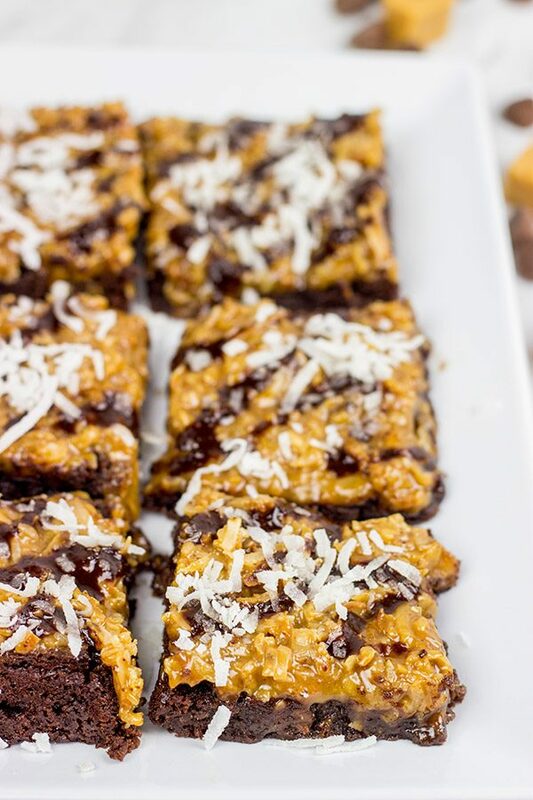 When Laura first came home and saw the batch of Samoa Brownies on the countertop, she thought I had made another batch of these German Chocolate Brownies. 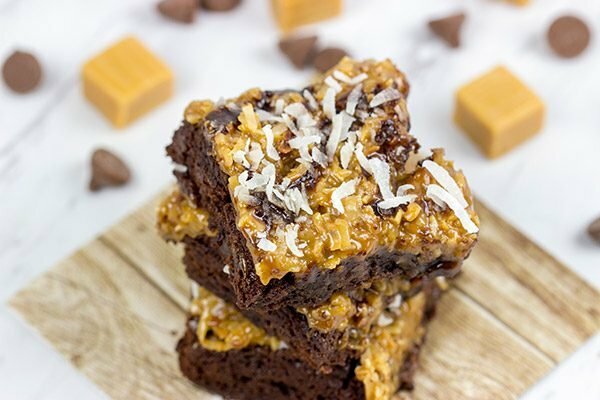 Truthfully, I guess they’re pretty similar except the Samoa Brownies version includes coconut while the German Chocolate version goes with chopped pecans. But hey, you can’t ever have enough brownies in your life, right? Enjoy these treats, friends! 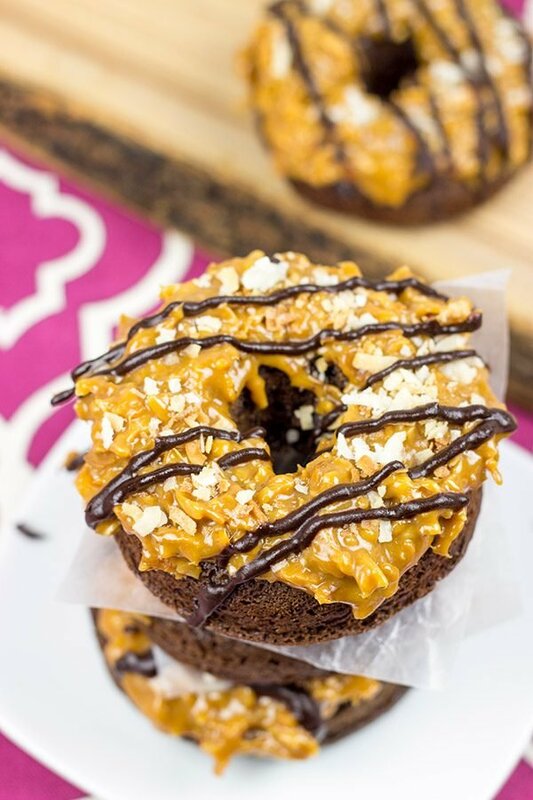 Oh, and if you’re looking for more Samoa-inspired treats, these Baked Samoa Doughnuts are really quite delicious, too! Grease and flour a 9”x13” baking pan. Line bottom with oversized parchment paper so that the paper comes up at least 2” on all sides of the pan. (This will help you remove the brownies from the pan later.) Set pan aside. Using a medium saucepan, add the butter, chocolate and 1 cup of chocolate chips. Place over medium-low heat, stirring often, until butter and chocolate have fully melted; set pan aside to cool. Pour batter into prepared baking pan. Bake at 350°F for 30-35 minutes, or until a toothpick inserted into the brownies comes out mostly clean. Spread coconut on baking sheet; bake at 325°F for 13-15 minutes, or until light golden brown in color. Place the caramels, milk and salt in a small saucepan. Heat over low heat, stirring occasionally, until smooth. Remove from heat and stir in toasted coconut. Place the chocolate and butter in a small microwaveable bowl. Heat in 20-second intervals, stirring after each interval, until smooth. Using a piping bag with a small round top (or a sandwich bag with one corner snipped off), drizzle tops of brownies with chocolate glaze. I recommend baking chocolate rather than chocolate chips for the drizzle; chocolate chips are designed to not melt as smoothly. Well these look absolutely delicious and they sound so good too! I could definitely eat one now with my lunch! Girl Scout cookie season is my nemesis. I totally feel you when it comes to using the side door. UGH! I feel so bad avoiding those little girls but I have no self control when I’m around a box of Girl Scout cookies. 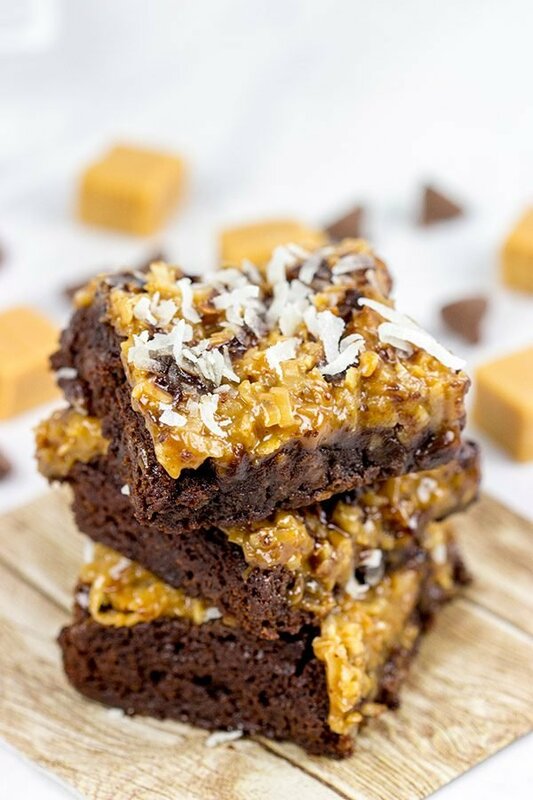 Do-si-dos are my favorites but Samoas are a close second so these brownies have my name written all over them. 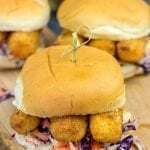 In fact, I might just have to make a batch this afternoon to eat while I watch ‘Cuse play tonight. Have fun watching basketball alllllll weekend. I know I will! Well I’m glad I found someone else with no Girl Scout Cookie control. I mean it’s for the kids, right?? Right?? 🙂 Also, I’m pretty sure we’re not allowed to be friends now this week, Kelsie. ‘Cuse-Duke on Friday night. Go Devils! OMG, your post is hilarious. Kieran took Homie to the dog park and found a girl set up shop RIGHT IN THE MIDDLE OF THE PARK with GSC. She’s too smart for her own good. Kieran said she was grinning ear to ear b/c she made bank. Everyone dog owner in the park (and this is a very busy dog park) bought a box or two… or six. Luckily for me, he bought a box of Samoa’s which are my favorite GSC. Now I’ve got to give that Girl Scout a *virtual* high-five because setting up in the middle of a park is nothing short of a genius move. I mean you’re already in a good mood if you’re frolicking in the park, and so therefore you’ll be more willing to buy cookies! Excellent move, little girl, excellent move. 🙂 And, yes, my Samoa craving is hitting me hard right now. Apparently the snow keeps the Girl Scouts around here a little more subdued…this coming weekend is the first weekend that they’ll be selling cookies. (I already looked up where they’d be…haha!) Thanks, Christina! David! How did you know Samoa were my favorite and that I’ve never met a brownie I didn’t like. Hi My Name is Mary, and I also have a problem with girl scout cookies. Mmmm frozen thin mints are the best. 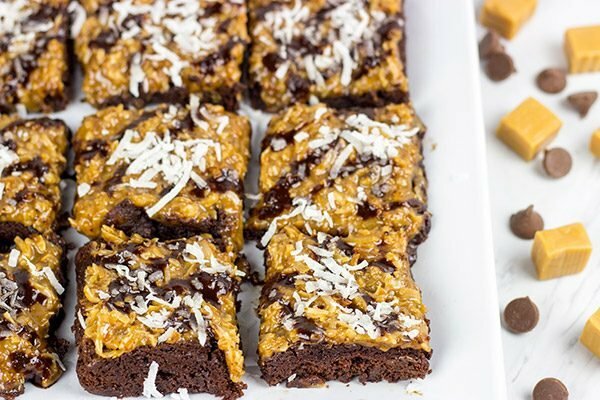 I’ve never tried coconut brownies, I bet they are crazy delicious. Haha! Hello, Mary, welcome to Girl Scout Cookies Anonymous. But it’s for the kids, right?? 🙂 Frozen thin mints are pretty much my Kryptonite, but these brownies topped with Samoa topping are right behind. I love a good brownie, and the topping on these is really, really good! Thanks so much, Mary! The problem I have with Girl Scout cookies is that they are so addicting… I feel like it’s impossible to eat just a serving (which is probably TWO cookies) of Thin Mints! I haven’t eaten them in years (I said no to two different little girls that came to my door a few weeks ago… I felt bad but I was like Sorry NOOOOO! Ha.) but my 2 favorites from childhood would have to be Thin Mints and Samoas. These brownies sound delicious! Yes! I can’t stop eating those darned cookies, either, Nicole. That’s why I’ve started sneaking in the side door at the grocery store. (You think I’m kidding…I’m not!) Fortunately (for me at least) we don’t get many Girl Scouts coming around door to door here. 🙂 That’s ok…I’ll just make brownies with Samoa topping instead! It’s good we don’t have scouts selling cookies in Canada…or perhaps I just need to download the app to locate them haha. The only one thing I don’t get is why do you need to buy all those cookies when you can bake EVERYTHING in your kitchen, David? (Don’t answer though. I know – you’re a kind person supporting girl scouts) Also I’ve never tried Samoa cookies which is strange as caramel and coconut is one of my favorite combos. Well, perhaps I should start with these brownies which look sensational too. No! Don’t download the app, Ben! I don’t know if Canada has Girl Scouts who sell cookies, but it’s not worth the risk finding out. Their cookies are just too darned addicting! Plus, it’s hard to say no since you’re helping out the kids. 🙂 So I haven’t bought as many cookies in recent years now that I bake a lot more, but I still have to buy a couple boxes a year. And as far as the stuff I bake here at home? Most of it goes to the curling club or Laura’s work. It just has to! I have no self-control. Haha! You should totally make a batch of these brownies, though. So good!! I have kids at my school who come around with the order form! I have to order…it’s for the kids! My all time favorite are also the Thin Mints. My second has to be the Samoa, but I usually buy just one box – and I’m not going to tell you how many Thin Mints! 🙂 These brownies look amazing! 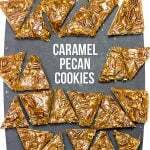 I love all that dripping, gooey caramel! Oh gosh, that would be terrible. I never realized how hard it would be for you and Girl Scout Cookies! I mean, I bet you get asked 15 times a day! And since it’s for the kids, I wouldn’t be able to say no. 🙂 And, yes, I share your Thin Mint love. A frozen Thin Mint is a thing of beauty! Haha! Thanks, Kathy! Those little kids get me every.single.time. So sneaky, lol. Whenever I’m at the grocery store and see them at the door selling cookies by the entrace, I have to get them. Ha! Anywho – these brownies looks divine, David! It’s just what my Monday needs 😉 Cheers to an awesome week! Haha…I’m the same way when I see the Girl Scouts setting up their table at the entrance of the store. And that’s why I’ve started using the side entrance. (You think I’m kidding? Not one bit!) And I totally agree with you that Mondays require brownies. That should just be a hard and fast rule. Mondays = Brownies. 🙂 Thanks, Dawn! Oh I’m making these! Someone who shall remain nameless ate the last Samoa yesterday. But TBH, these look better than those – I can say that, I used to be a Girl Scout, after all. I like the brownie idea and you know, I can never turn down something with caramel. Or coconut. Or chocolate. I’m going to stop here. 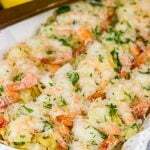 Thanks for the recipe – pinning! Oh no! The last Samoa!? That should be a family decision as to who gets the last one…but someone was sneaky in your house! Good thing its still Girl Scout Cookie season, right? Although, to be fair, these brownies give the cookies a serious run for their money. I love a good chewy brownie, and then top it with Samoa topping? Sign me up for the whole tray! 🙂 Thanks so much, Laura! I know what you mean when it comes to Girl Scout cookies, they are so good. I try to avoid the tables also. But who needs Girl Scout cookies when you can make these yummy looking Samoa brownies. 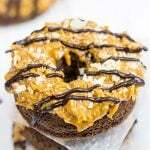 Love this twist on the classic Girl Scout cookie – I’ll take two please!! Duuuuude, I could eat the topping off of the whole tray of these Samoa Brownies with a spoon myself! Gosh, I made it to step #9 “Place the caramels, milk and salt..” before drooling uncontrollably like my Newfoundland Mix! I used to be a thin mint fan myself (true – frozen they are insanely decadent) but a friend introduced me to samoas and tagalongs and I used to not be able to walk by a table without at least 5 boxes – though this year I’m at 0! But thats mostly cos I don’t know any of the girl scouts out in Athens but back near where I used to live that wasn’t the case! Happy Thursday to you and the rest of the Spiced clan! These Samoa brownies look like the real deal, David! I’ll order seven boxes. Hey there, Missus B! Thank you so much for considering these Samoa Brownies for your next fund raiser. 🙂 To answer your question, it would depend on how large you slice each brownie. These brownies are baked in a 9″x13″ pan, so if you cut each brownie into a 2.5″ square, then you’d get 15 brownies per batch. Of course, if you play with the size a bit, then you can get more/less brownies. In my experience, larger always does better at fund raisers/bake sales! In terms of scaling up the recipe, I totally know what you mean. While I have not scaled this recipe up to larger batches myself, the only thing I might be careful with is salt. (I remember a chef friend of mine telling me years ago that salt and cayenne pepper are the two primary ingredients to be careful with whenever scaling a recipe.) In this case, I might add 1/2 as much salt for each additional batch of brownie batter. The topping should scale just fine as it’s basically just all mixed together without really baking. I hope this helps, and feel free to ask if you have any other questions. 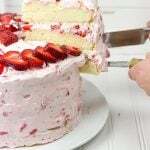 Happy baking and good luck with the fund raiser!